Richard B. Russell Library for Political Research and Studies: Informal Forum (9/24/10): What is the Mission for Our Public Schools? 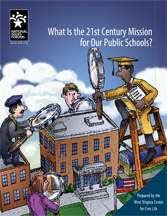 Informal Forum (9/24/10): What is the Mission for Our Public Schools? September 24, 2010, 3:00-5:00 p.m.
• How do we ensure that our schools are accessible to all children? • What is the role of families in the education of their children? • What is the responsibility of schools in addressing social issues that affect their students? • What is the most efficient and fair way to fund public education?